The plan is to meet near Hyde Street pier, where those who need to can rent bicycles and helmets from nearby rental shops. 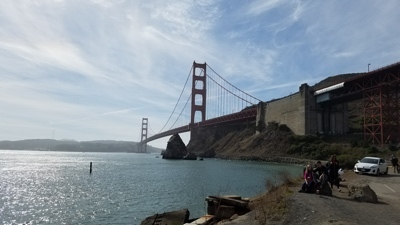 We will then bike through some well known (and scenic) San Francisco landmarks - Fort Mason, the Marina, and Crissy Field - before crossing over the Golden Gate Bridge. Once across, our route will take us through Fort Baker, Cavallo Point (if time permits) and on to Sausalito. At this point, faster riders may choose to continue on to Tiburon. For those who opt out of the longer ride, there is plenty of dining, shopping, and sightseeing in Sausalito to keep us entertained, until we return to San Francisco via ferry.